It's not technically British, and may be sacrelige, but it seems like a quality Cobra kit would fit in this group as well. Yeah, I'm going with Dave on this. I raced with a very well-sorted, supercharged TD at New Hampshire a few weeks ago and I was surprised how decent it went. I could keep my stock-ish Spridget in front of it, but I really had to push hard. And all T-series MGs look cooler than most other cars. 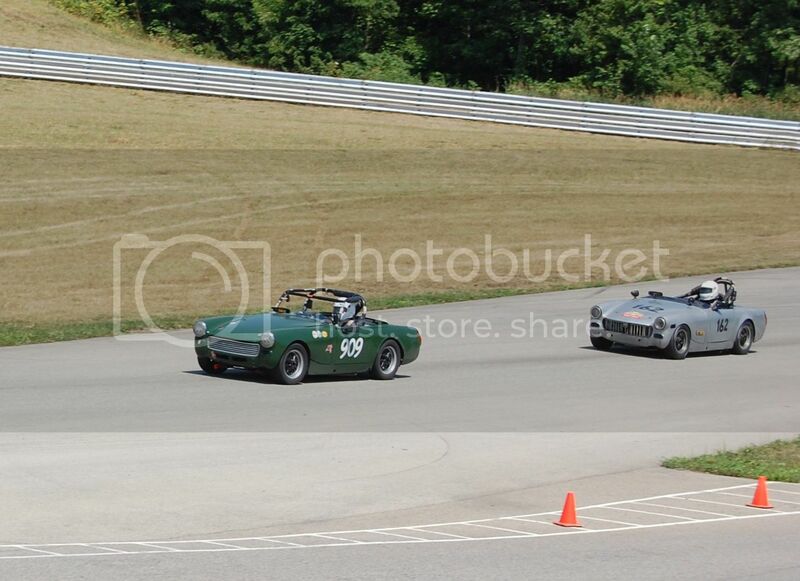 I do belive that my 1966 Morgan with the BDR may have to disagree with you on that! you guys are funny, are you sure this isnt a comedy act? I still say the MGB is simply the best sports car in the world. There is: Faster, Slower, Cheaper, Harder, Softer, Slicker, Smarter, Dumber, Rarer, Commoner....ECT, ECT, but it seems, all are sooner or later compared to the B. Which is a fair, not good but fair copy of a 1600 Datsun Roadster. This is my MGB. Nice car and I like it quite well. But I am looking at other cars right now (probably a Caterham) so it might have to go. Overall, I'd prefer driving a nice street Spridget than an MGB. 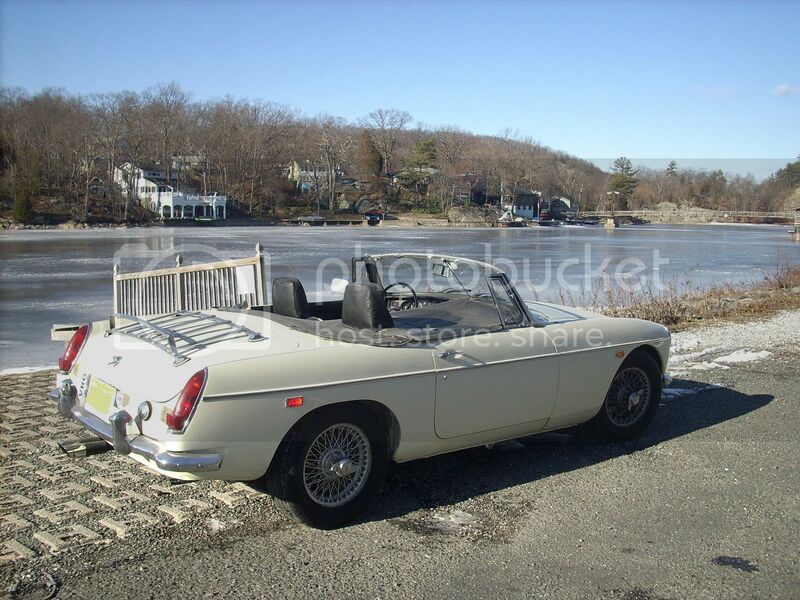 The stuff about the MGB being a copy of the Datsun roadster is often cited. I don't really care one way of the other, but I'd guess they are really just parallel designs that came out around the same time. I doubt MG made any reference whatsoever to the Datsun Fairlady, which (AFAIK) is not a unibody car. The MG prototype ADO23 was released in 1960 (tiny picture below). The 1500 Fairlady wasn't seen until 1963. Both neat cars in my view. Speaking of Triumph, I'd like to own a TR-10 sedan. 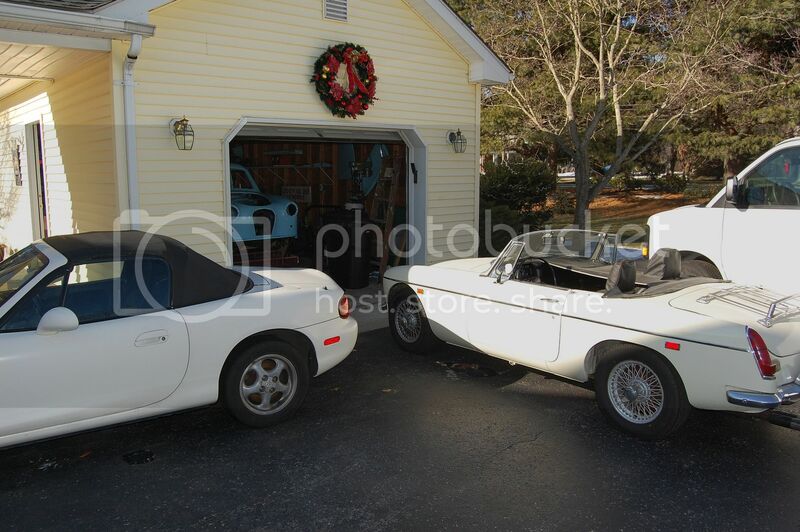 Yeah, my MGB, MX5 and race-Spridget all live in the same garage. All nice cars in their own right. Is that a Austin A35 in the garage? Always liked those. I agree 100% But it's not a good day if I can't get a rise out of Leo or he of me! TGM wrote: Is that a Austin A35 in the garage? Always liked those. Yes. RaceCar 2.0 for me. Been working on it for a few year and hope to get it going this year. It's a disease. Leo and many other folks here will understand. Here's the #909 race-Spridget (3 weeks ago). I'm new to the site, so please, don't be too hard on me for asking this, but I've always been intrigued by the Triumph V8 Stag. I know it's far from the best British car and many say worst, but are there options, redeeming qualities for this car? For small bore cars I would lean towards the TR4 or the MGB. 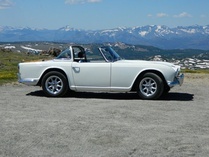 I prefer the styling of the TR4 and love the interior as well as the driving experience. If you want older then the TR3 is to me impossible to beat. Fast, great looking, especially the small mouth cars and fun to drive. For best affordable I would pick the Spitfire. Just impossible to beat the spit for $3,000. For best mid range car, I would pick the Jaguar e-type, ideally a series 1 roadster though a series 2 drives a bit better and is cheaper. Don't believe it? Drive one. As far as ultimate British car that I have ever had the pleasure of driving is a Jaguar D-type or XKSS. I know they are millions of dollars but I have been blown away by both every time I have driven one. Combine that with the way they look and those two are my ultimate winners, hands down. Aston Martin DB4-6. The looks, comfort and performance are hard to beat. Here is a secret, to get most of the performance, looks and fun to drive, the E-type coupe offers 95% of what the Aston does for a fraction of the expense. I honestly love the series 1 Jaguar XJ6. A lot of world class sedan attributes in a very affordable package. I do not like the series 2 or 3 cars nearly as much as the original. toff wrote: I'm new to the site, so please, don't be too hard on me for asking this, but I've always been intrigued by the Triumph V8 Stag. I know it's far from the best British car and many say worst, but are there options, redeeming qualities for this car? The problem isn't so much the design of the Stag, but the (lack of) build quality. They rust with the best of them and the 3L V8 used to have lots of issues with overheating, most of them caused by assembly issues rather than inherent design problems. Issues like the factory bolting the engine together without cleaning the casting sand residue out of block or heads were far from uncommon. They were also built during a time of very fraught labour relations in the UK which didn't help the build quality. Most of the issues - especially the engine-related ones - can be fixed these days so a good one still makes a pretty decent grand tourer, but you'll never get rich restoring one. There are as many interesting choices as there are enthusiasts, but the British car I would want more than any other is a Lotus Elan. Especially if Ms. Emma Peel comes along. Dave_Jorgensen wrote: Gentlemen, you have it all wrong. My supercharged 1953 MGTD is the best British car ever made. Never mind that it was completely rebuilt and re-engineered in western Canada, it has Queen Victoria stamped all over it and will eat your TR6's, TR8's and Tigers for lunch. I can go 98 miles per hour, so you should all be very afraid. Plus, mine looks way cooler than all yours. Dave My Mk II Tiger will do 125 mph.... Be VERY afraid! I've driven many a British car 3 to 6 and B to E but the one that seemed best was a Lola...........it did have a Pinto engine in the back but it did go well..............the Royale with the Cortina engine was almost as much fun. What I would really like is a Mallock, perhaps with a Mazda engine. Tom Heath wrote: There are as many interesting choices as there are enthusiasts, but the British car I would want more than any other is a Lotus Elan. Especially if Ms. Emma Peel comes along. Make sure it's Type 26 (S1 or S2) or a coupe'. The best of the lot in my book. After owning 4 Elans I could never make myself buy one with the side window frames (S3,S4, and Sprint). They are great cars don't get me wrong, but evertime I look at one I just want to rip those window frames off. I obviously have issues we can't get into here! My thoughts as well. Im sure there was a reason why Lotus did that, but DANG, it sure is fugly.